Technique used after Thornback ray became trapped in its egg case. 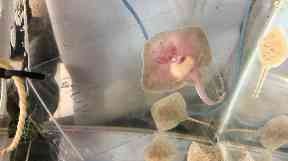 A baby Thornback ray has been saved from death by being able to grow in a sandwich bag. Macduff Marine Aquarium employee Frazer Mackay found the embryo trapped in its egg case, or mermaid's purse, while cleaning out the tank just before Christmas. Mr Mackay explained: "As the pouch develops over the year, the pouch should split, which them allows the egg to be released. Sadly, this little one's egg didn't pop. "So I opened it slightly just to make sure something wasn't in there, and sure enough there was a baby. "I cut the egg open and removed him, put it in a bag and sure enough, in about an hour it started wriggling and was alive." Mr Mackay said the technique has been used before at their aquarium and others around the world. The conditions in the bag can mimic the mermaid's purse, as it's spacious and allows fresh water to flow inside. The rays survive off their yellow and white yolk sack, and are kept well fed while in quarantine. They will move into a bigger public display tank in a few weeks' time.